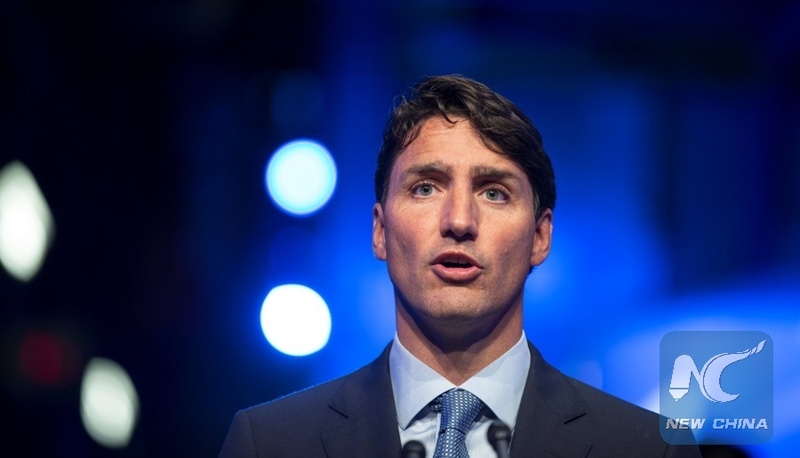 OTTAWA, Aug. 8 (Xinhua) -- Canadian Prime Minister Justin Trudeau said Wednesday that Canada will always stand up for human rights, as the dispute over the issue with Saudi Arabia escalated. Trudeau told a press conference in Montreal that Canadians have always expected his government to speak strongly, firmly, clearly and politely about the need to respect human rights at home and around the world. "We will continue to stand up for Canadian values and indeed for universal values and human rights at any occasion," Trudeau said in his first response so far to the dispute that caused tensions in bilateral ties between Ottawa and Riyadh. "That is something I will always do," he added. The prime minister's comments came just hours after Saudi Arabia Foreign Minister Adel al-Jubeir ruled out the possibility for mediation and warned of more punishment against Canada. "There is nothing to mediate. A mistake has been made and a mistake should be corrected," al-Jubeir said. Trudeau told reporters that Canadian Foreign Minister Chrystia Freeland had a long conversation with al-Jubeir Tuesday, and that diplomatic talks were still going on. On Friday, the Canadian foreign ministry tweeted, "Canada is gravely concerned about additional arrests of women's rights activists in Saudi Arabia, including Samar Badawi. We urge the Saudi authorities to immediately release them and all other peaceful human rights activists." Badawi's brother, Raif Badawi, is a prominent blogger. He was sentenced to 1,000 lashes and 10 years in prison in Saudi Arabia for "insulting Islam through electronic channels." His wife and children live in the Canadian province of Quebec and are Canadian citizens. The Saudi foreign ministry published a statement on Twitter on Sunday saying the Canadian statement "is a blatant interference in the Kingdom's domestic affairs, against basic international norms and all international protocols." "It is a major, unacceptable affront to the Kingdom's laws and judicial process, as well as a violation of the Kingdom's sovereignty," the statement read. Over the past few days, Saudi Arabia expelled the Canadian ambassador, froze new trade and investment in Canada, withdrew some 16,000 Riyadh-funded students from Canada, and announced a suspension of Saudi Arabian Airlines flights to and from Toronto. The Financial Times reported Wednesday that Saudi central bank and state pension funds have instructed their overseas assets managers to dispose of their Canadian equities, bonds and cash holdings "no matter the cost," citing two anonymous sources. The worsening ties also cast doubt on the future of the 15-billion-Canadian-dollar (about 11.5 billion U.S. dollars) deal in which Canada will supply Saudi Arabia with armored vehicles. "Obviously Canada will always stand up for our workers and our companies. We need to make sure that we're protecting Canadian interests in any situation," Trudeau said, skirting the direct economic impact on his country. Saudi Arabia is Canada's 19th largest trading partner and the source of some 10 percent of Canadian crude oil imports. Bilateral trade between the two countries amounts to nearly 4 billion Canadian dollars (about 3 billion dollars) annually.